Democratic Republic of Congo: Wars for what? The Democratic Republic of Congo has been subject to one of Africa’s deadliest wars, with estimates of 5.4 Million deaths, directly or indirectly due to the war, between 1997 and 2007 (IRC(2007)). Yet due to the weak capacity of the Congolese State and the sensitive nature of this information, there is no systematic data of the strategies that armed groups employ and employed locally or of the motives that lead them to use systematic violence against, while protecting them in others. My own preliminary fieldwork suggests that when the community is endowed with high value and taxable minerals, armed groups prefer to refrain from using violence and instead protect their population. There is a unique opportunity to learn about motives of violence and peace from this context, because both the weakness of the Congolese state and the economic activities of dozens of armed groups entrenched in the mineral sector generate substantial variation in strategies and behavior by these armed groups suited to statistical analysis. This context offers therefore a unique opportunity to assess the causes of the different uses of violence by armed groups, for conflict or for protection. A proposal: Systematic data collection on armed group’s historical strategies: The proposed project implements a systematic data collection in a target of 100 villages in eastern Congo. Based on the results from the pilot of this project in a first set of villages, the research can credibly produce historical village-level data on armed groups presence, activity, and strategies, as well as social and economic historical data. This data will allow to use statistical techniques based on surprise shocks to different mineral endowments present in these villages in order to assess the causal relationships leading armed groups to exercise different types of violence, in particular whether to loot and abuse the civilians, or instead to use violence to provide security for the civilians and invest in legitimacy, a strategy often used by armed groups. The analysis promises to learn about the causes of violence against civilians and the causes of peaceful uses of violence (for protection, like proto-states). However, it will also advance existing knowledge on the origins of proto-states organizations that monopolize violence to protect civilians instead of against them. Finally, the wealth of the historical economic, political and social data collected, will allow for a long term research agenda answering potentially many other questions, for instance about the organization of self-defense groups or the use of sexual violence during wars. Team and experience: The research team consists of 6 enumerators and one supervisor that were selected among 100 enumerators that were part of a pioneering data collection project I designed and implemented with Professor Macartan Humphreys between 2010 and 2012 (http://cu-csds.org/wp-content/uploads/2012/06/20120622-FINAL-REPORT.pdf). They were trained during 4months, and collected survey data in 812 villages over the course of 1.5 years for the purpose of evaluating the social impacts of a development intervention. Based on the unique capacity hence created in eastern DRC, as well as the expertise the enumerators derived during the pilot of this project in the visits to mining villages exposed to armed groups, our team has a grounded experience and is very familiar with the proposed work. Some states engage in violence against civilians while others protect their populations and provide public goods. Why? The theories of the origins of strong states describe their formation out of violent organizations. Descriptions of the transition from predation to protection by feudal lords and Chinese warlords are found in Schumpeter (1919), Tilly (1985), and Olson (1993). Despite the rich existing body of knowledge, violence is relatively new in the field of economics, and no work has been done yet do test it with sound statistical methods. With the proposed project, I make use of causal inference techniques to address under what conditions warlords in eastern Congo find it preferable to invest in village-level state-like institutions rather than engage in violent expropriation and civilian abuse. My preliminary qualitative fieldwork in eastern DRC with mineral traders that work with local armed groups demonstrates that these groups develop state-like institutions in some villages and protect the civilians. However, this preliminary evidence is based on the traders’ narrative and lacks a sound statistical demonstration of causal channels leading to armed group uses of violence. The core of this study is therefore based on the analysis of highly disaggregated, village-level and household-level original large-n data I that have been collecting in eastern Congo with a team of 6 enumerators. These data will reach a sample size of 100 villages and covers the period of 1990-2012, hence comprising the Congolese wars and post-conflict period. I am applying causal inference methods to demonstrate how armed groups strategic use of violence changes in response to their economic incentives in the village. Contrary to the priors in my discipline, my own preliminary evidence suggests that when the community is endowed with high value and taxable minerals, armed groups prefer to refrain from using violence and instead protect their population and even provide public goods, in order to increase and tax the village production. In order to generate unique original data on armed groups, I am implementing a data collection exercise in a region where there is both a weak state capacity and numerous active criminal organizations that control the means of violence. The data collection methodology is grounded in a few years of successful research experience in the field, during which I implemented an impact evaluation in 812 villages throughout eastern Congo; an evaluation that required the work of 100 enumerators during 1.5 years. In addition, after 5 months of preparatory fieldwork, this project has already completed its proof of concept and the resulting data demonstrates that it is possible to collect very high quality data with the proposed methodology. The data will contain variation over time and across villages in degrees of civilians’ expropriation and abuse, as well as public goods provision and protection by armed groups. This exercise produces a retrospective panel dataset that traces back individual household choices since 1990, village histories on a yearly basis, crossed checked by households’ data from household surveys. To address the question in this context required designing measures of the outcomes of interest that can be implemented realistically, capture the behavior of interest, and minimize measurement error. After two months of field experimentation with different measures, I chose the following strategy. I first sampled set of villages that display variation in presence of different minerals, and over time; and then exploit yearly recall from village authorities and households since 1990 in a 4 days long village visit to each village. A main constraint with measurement is that recall data can have large measurement error. Gine and De Nicola (2012) formally test alternative strategies to minimize this source of error. Drawing on their work and on field-tests of the instruments, the measures were carefully designed so that this source of measurement error was minimized. First, I designed relevant time cues to activate respondents’ recall (2 at least for each year). These cues contained political events known to the respondent’s population as well as the name of the Congolese currency (the currency changed 4 times since 1990). Second, design of the questions focused on transitions and events in order to minimize recall effort from the respondent (for savings, for instance: “when did the respondent acquire cattle” and “price of the cattle”, rather than “yearly savings in dollars”). Finally, measures of numerical working memory are being collected in the surveys in order to produce alternative tests weighting observations by the ability of the respondent to memorize numbers. This shift in design proved to be extremely effective in the piloting of measures to bring measurement error to credibly low levels, as well as to measure the extent of the error. This section describes the care taken to produce estimators of causal effects. In order to circumvent the potential biases arising from interpreting correlations as causation, I use atypical and huge variation in world mineral prices that is credibly unrelated to any difference over time in the differences in potential outcomes between villages (this is the source of exogenous variation). At the start of year 2000, anticipating the Christmas demand rush on Playstation II, Columbite-Tantalum processor firms (Columbite-Tantalum is a mineral that is used for Playstation II) revised expectations around future scarcity of Columbite-Tantalum. This generated a drastic rush on the mineral. Most extraction took place in Australia, and production and prices were agreed in forward contracts, resulting in inelastic production and prices. It is well documented how this drastic rush into Columbite-Tantalum caused the spot price (the mineral not coming from Australia was sold on the spot market with daily prices) of this mineral to rise from $91.4 per kilogram to $591 per kg during the whole year 2000 (Prices taken from USGS). However, this mineral had been recently discovered in the eastern provinces of the DRC (named coltan in DRC) and was not exploited. As a result of this boom, foreign buyers quickly turned to the DRC and the armed groups reallocated activities from gold to coltan areas. This shift has been documented in investigations led by the UN Group of experts in UN (2002). 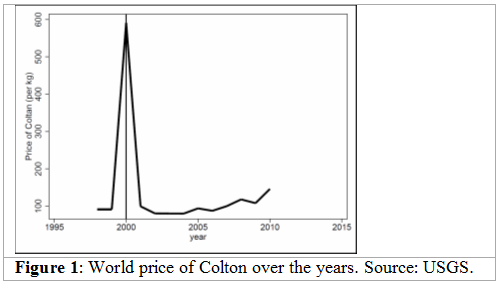 In 2001, when demand for Playstation II over Christmas failed to meet expectations, the spot price of coltan fell back to its original levels and markets virtually disappeared in DRC, to reopen only some years later. Nest (2011), contains a detailed description of the coltan market. In addition to this individual boom, it is easy to document similar dynamics for the price of tin and of gold over the past 15 years (global economic slowdown, Congolese government ban on artisanal mining in 2010, and Dodd-Frank act, which is a defacto embargo on mineral exports from the DRC). I will use these atypical world price shocks as well as the fact that some minerals are present only in a subset of villages to compare the effects of the price change on the change in armed groups behaviors’ in villages that are endowed with this mineral, to the change in armed groups’ behavior in villages that are not endowed with this mineral. To identify treated villages, I completed an existing dataset (IPIS) by at length interviews with various traders specialized in the region. These traders travel throughout region buying and selling minerals to the Comptoirs in Bukavu and Goma. In the interviews, I created lists of mines, their minerals, their administrative divisions, and their histories of armed groups’ presence. In addition, I obtained a mines dataset from a local agency that represents artisanal miners (SAESSCAM) that contains GPS locations for most mines and their administrative divisions. To design an acceptable sampling frame, I used the data from Referentiel Geographique Commun to construct the population of villages. This data contains all known GPS located villages, but suffers from potential selection biases since the most remote villages do not appear (a problem that the dataset of mining villages does not have) and has inconsistencies of administrative levels of the units. To address these concerns I completed the RGC data with independent reports from interventions of the Rapid Response to Movement of Populations. Based on this data, the sampling strategy minimizes observed constant heterogeneity to address village self-selection (although treatment is the interaction of a time varying variable and a mineral dummy, so this is not a major concern). I randomly sample the largest possible number of mining villages, conditional on funding, while the control group is constituted by nearest-neighbor matching using the Mahalanobis metric. I use this technique because it has the advantage that the researcher doesn’t need to assume any given model for treatment assignment. There are relatively few studies that evaluate the impact of propensity score model misspecification (See Stuart (2010)) on bias of the treatment effect estimates. It produces an estimator for the average treatment effect on the treated that is more robust to potential biases arising from villages heterogeneous potential outcomes. GPS coordinates are used to obtain for each village: altitude, distance to the closest road (which has a large impact on the village), distance to the forest (where some rebels are often based), altitude (altitude is related with rebel activity) and crop suitability from the GAEZ (2012). The metric is taken from Mahalanobis (1936), was introduced for matching in Rubin (1980) and was applied to non-experimental study design by Rubin and Stuart (2007) and Stuart (2010). This sampling strategy will produce an estimator of the average treatment effect on the villages that do have mines, therefore identifying the effect on the most relevant sub population while tightening identification. For the household surveys, enumerators consolidate, together with the village authorities, a village household census. Enumerators then use a list of random numbers previously drawn, that selects household for any potential village size, based on their number in the census. The same method is applied to select respondents in the household. Expecting high intra household correlation of shocks, only one respondent is randomly selected in each household so that more households can be surveyed. These enumerators are collecting data based on Personal Digital Assistants, which allows receiving the data on a bi-weekly basis. Tracking is automated and based on Frontline SMS: teams send a text message at every village entry and exit to a local cellphone. The text messages are synchronized to a local computer that compiles a database of teams’ location, shared with me on a daily basis. A battery of strategies have been put in place to address enumerators’ potential moral hazard, but supervision will be the central monitoring device as well as necessary logistical support for teams. Based on previous fieldwork experience, I have therefore planned the presence of Supervisor, that will carry equipment, transport replacement to teams, assist the teams with unexpected problems, and ensure communication with the co-PI through weekly phone calls and reports upon his return to the main cities. During preparatory fieldwork in 2012, I conducted at length interviews with local mineral traders on a daily basis. According to the traders, armed groups cooperate with miners when the market conditions are good; they tax the miners on a regular basis and they provide security in the mining sites. These interviews revealed that violence was significantly more frequent in gold areas. According to the traders, this was because gold can be hidden, so there is mistrust. In addition, traders’ interviews revealed that there was more security in mining areas than agriculture areas, resulting from the same mechanism: armed groups prefer to protect the labor force in mining areas. This evidence is not the core part of the research but was used to inform the design of the main data collection project by tailoring hypotheses and measurement. Figure 4 shows that the coltan shock had a persistent effect on the population occupational choice. The graph plots the coefficients of the estimated difference in the probabilities that a household randomly selected from a coltan village (as compared to a household randomly selected in a no coltan village) was working in the artisanal mining sector, between the average villager in a coltan village and the average villager in a non-coltan village. Does this change in strategy by armed groups result in a reduction of violence against civilians? The following figure, based on data from the current sample of 35 villages, suggests it does. It shows the number of attacks against civilians over the period, separating observations by whether in that given year, the unit was a mining camp, a village supporting the mining camp, or any other rural village. 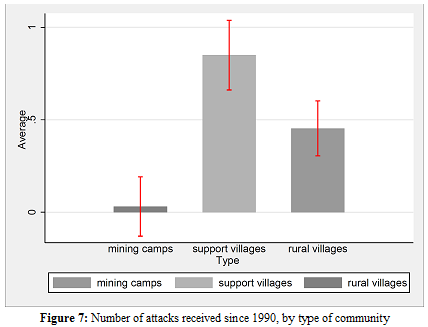 While mining camps are as numerous as support villages this graph produces, as expected, the counter-intuitive and suggestive result that the security provided by armed groups in communities where labor is working in mines is effective at reducing attacks against civilians as compared to communities without mines. The above preliminary evidence is suggestive that it is possible to collect high quality data following the proposed data collection strategy; that the price and endowment changes used for identification are so large that they are having an effect on the local variables of interest. Numerous explanations have been proposed for the origins of states, but they remain largely untested; this study will first refine explanations to answer that question and will test them in the context of armed groups; it will therefore also contribute to the literature on armed groups by importing insights from state formation and optimal taxation. It will also advance this literature by the introduction of causal inference techniques exploiting unusual well documented variation in prices and endowments, in a field where these techniques have not been unexploited. Finally, it will do so by registering specifications prior to data analysis, a practice never used yet in observational studies. 1. State formation literature. Why would an Olson’s bandit (Olson (1993)) find it optimal to become stationary? From Hobbes (1651) to Carneiro (1970) and Tilly (1990) social sciences have tried to understand the formation of modern states as centralization of violence. Only recently did economists consider the role of the state in economic growth (North (1991), Besley and Persson (2011)) and investigate what determines the emergence of strong states (Olson (1993), Grossman (1997), Grossman (1998), Acemoglu (2005), Acemoglu (2011), Acemoglu et. al (2007)). Bates (2008) and Bates and Greif (2002) argue that the fragility of African states is due to weak incentives in the context of a repeated interaction with income generating civilians: the value of future income taxation against the value of predation today. A second related explanation is that the threat of tax evasion by the population weakens the ability of warlords to settle and collect taxes peacefully, resulting in predatory criminal organizations rather than strong states (Herbst (2011)). This argument enjoys substantial popularity in political science Scott (2010) and has also been proposed as an explanation in other disciplines (Carneiro (1970)). This study will contribute to this body of untested knowledge. It will first refine the theory to demonstrate how the nature of endowments determines criminal organizations’ incentives to protect or abuse the population. It will address the states’ formation literature from the lens of optimal taxation by armed groups. The core of the argument is as follows: when output is hard to observe, optimal taxation is second-best and renders predation more tempting than peaceful taxation, as for endowments with low value. These theoretical contributions will then be tested exactly in the context that inspired Olson’s work on states: warlords. 2. Literature on armed groups. This study identifies a unique region where the weakness of the central state allows for variation of levels of state development by decentralized criminal organizations. By exploiting a data collection capacity that I built in 3 years of previous work in the area, this study will generate unique disaggregated data on armed groups’ strategies of violence at the local level, generally unavailable where states lack data collection capacity. Some work has been done in understanding the trade-offs that armed groups face and their strategic uses of violence but this study is the first sound empirical attempt that acknowledges the trade-off between protection and abuse, based in a finely disaggregated village and year level data. Humphreys and Weinstein (2005) focus on the incentives of civilian abuse, Weinstein (2006) develops a theory of how endowments shape armed groups strategies, and Beber and Blattman (2008) study how armed groups provide incentives to soldiers through violence. Perhaps the most serious empirical attempt to test how armed groups’ use of violence is linked to economic motivations is Dube and Vargas (2008). While Dube and Vargas (2008), like Dal Bo and Dal Bo (2010) focus on how factor prices affect the incentives to fight, this study will contribute to this literature by addressing a very distinct question; it exploits exogenous variation in mineral prices but in the context of the patron-client relationship of armed groups with civilians, as states in the making. A question unexplored by lack of data. 3. An unexplored area for causal inference. This research produces a unique finely disaggregated dataset (at the level of villages and mines) that allows to introduce causal identification methodology, analogous to the medical sciences experimental literature and the applied microeconomics literature. To identify the causal effects of the value of different resources on incentives of armed groups to turn stationary and protective, this study exploits unexpected variation in world prices of minerals, whose source of speculation is very well documented (Nest (2011), Stearns (2011), UN (2002)). These shocks are a unique opportunity to provide causally identified estimates of the effects of endowments on protection and violence because they are credibly unrelated to local changes, except through their direct causal channel. In addition, a sampling frame was constructed based on the best available sources and villages were sampled in such a way as to minimize potential self-selection based on observable characteristics. The proposed research project is designed to distill the economic rationale of the strategic uses of violence by armed groups, especially violence against the civilian population. Previous qualitative work as well as my own preparatory fieldwork demonstrates that armed groups in eastern DRC often prefer to use violence to protect the population rather than use it against the civilians. This situation leaves a question unanswered of what leads these armed groups to use violence in “peaceful” ways, substituting for the services the Congolese is unable to provide, mostly legitimate provision of security (in exchange for taxes). What we can learn from the DRC case that will help us address the causes of violence against civilians is exactly the purpose of this project. It is expected, based on extensive preparatory qualitative fieldwork and contrary to what is often believed, that armed groups do use violence to protect the civilians in many cases, instead of abusing them, and that they do so when they find it profitable in the long term. This is the case, for instance, when mineral resources that are easy to tax by the armed group are produced by the civilians, which places the armed group in a position of dependency with the civilians. It is less likely to be the case for mineral resources that are hard to tax, for instance, if it is easy for the civilians to smuggle it (gold). While the motives leading to use of violence are complex, the economic logic plays an important role in violence in eastern Congo. The proposed question is therefore at the heart of the disciplines of economics, political science, but also political anthropology. There is a unique opportunity to learn about motives of violence and peace from this context, because both the weakness of the Congolese state and the economic activities of dozens of armed groups generate substantial variation in strategies and behavior by these armed groups. It is through statistical analysis of the causal determinants of this variation in strategies that this project promises to understand the logic of violence or peace (protection) of armed groups. The Democratic Republic of Congo has had one of the deadliest wars, with estimates that about 5.4 Million civilians have lost their lives, directly or indirectly due to the conflict between 1997 and 2007. And yet, because of the lack of state data collection capacity as well as the military nature of this data, there is no generalized evidence of the behavior of armed groups in the conflict and “post“-conflict period, or the motives that have led armed groups to use violence in various ways. The proposed strategy to generate generalizable knowledge about the causes of violence is systematic yearly historical data collection over hundreds of villages. Following the pilot of this project in which instruments were designed and field tested, I demonstrated that it is possible to collect surprisingly rich and accurate data on historical armed groups’ strategies and their relationship with the economy: types and level of taxes, uses of violence against civilians, levels of protection, as well as historical local prices, presence of mineral endowments and households economic histories. With this systematic data, together with unusual surprise shocks to mineral prices (especially the year 2000 coltan shock), it is possible to assess in credible ways how armed groups’ uses of violence respond to changes in the environment affecting the local economy. The implications from this research are large for understanding war and peace phenomena. The proposed project promises to produce the first systematic evidence of armed groups strategies over a period of 20 years in one of the most conflict affected areas, and learn exactly what drives them to conduct “war” against the civilian population, and what drives them instead to produce peaceful protective institutions. In addition, the understanding of the causes of violence must also have implications on the design of strategies to prevent violence and protect civilians from war. In particular, if the theory this project intends to demonstrate is valid, it would suggest that in situations where peace-keeping operations can be ineffective, a possible substitute are policies that empower the civilian population and create situations where armed organizations become dependent on civilians. The case of the Dodd-Frank Act is related to this research. While the effects of this legislation could be positive in the long term by cutting mineral revenues to armed groups, in the short term it cut mineral revenues to a large part of the population, and there are anecdotal accounts of how armed groups’ violence against civilians increased rather than decreased, as they found themselves in need of revenues that they could no longer derive from the mineral sector. First, the results from this research will be shared in the final report to be drafted by December 2013. Second, a series of academic papers will be written and submitted for publication in the year 2014. All reports and papers will be available from my website. In addition to these written dissemination strategies, I plan to organize a workshop in the city of Bukavu with key actors involved in violence of armed groups in eastern Congo. I will invite especially local actors, for instance the NGO APC, that has been working on armed groups for many years and is well recognized among the population. Ideally I will also have the participation of key actors from the Congolese administration of the Province of Sud Kivu as well as representatives from the United Nations Mission in the DRC (MONUSCO) and international NGO’s. The data generated will be available publicly on my webstite and will be archived in the Academic Commons of Columbia University upon publication of the primary research outcomes. The data will protect the privacy of subjects (households are deidentified during data collection) and village names and G.P.S. location will be removed to prevent deductive disclosure of individual villages or even households within villages. Acemoglu, Daron; Ticchi, Davide; and Vindigni, Andrea. “Emergence and Persistence of Inefficient States”. Journal of European Economic Association, February 2011, 9(2), pp. 177-208. Global Agro Ecological Zones. http://www.iiasa.ac.at/Research/LUC/GAEZv3.0/. International Peace Information Service (IPIS) Map:”Militarized Mining Areas in the Kivus” (http://www.ipisresearch.be/maps/MiMiKi/Areas/web/index.html) and direct exchange with the institute for database in different formats. Referenciel Geographique Commun (RGC). http://www.rgc.cd/ (Localites database). Reponse Rapide aux Mouvements de la Population. (RRMP) http://www.rrmp.org/. All evaluations. Rubin, Donald B. “Estimating Causal Effects of Treatments in Randomized and Nonrandomized Studies”. Journal of Educational Psychology, 1974, 66 (5), pp. 688–701. Stuart, Elizabeth. “Matching methods for causal inference: A review and a look forward”. Statistical Sciences February 2010, 25(1): 1–21.